Art historian Yukio Lippit in the Japanese merchant's house at the Boston Children's Museum. Watch a film clip  showing the reconstruction of the Boston Children's Museum's Japanese house. 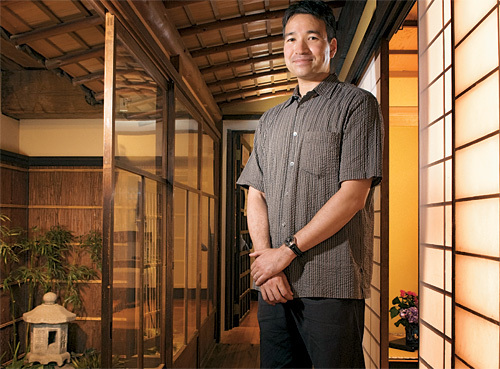 When you enter the Japanese house in the Boston Children’s Museum, says Yukio Lippit ’92, “you feel a little bit Alice in Wonderland-ish.” Stepping into this nineteenth-century Kyoto merchant’s house does feel like going down the rabbit hole. The color and clutter of the neighboring exhibits disappear. Aside from tatami mats on the floor and a low table, the house appears empty. In the Japanese merchant house at the Boston Children’s Museum, Lippit points out different wood types in the tokonoma alcove. By focusing on the pillars and walls of the merchant’s house (an example of the kyo-machiya style), Lippit is trying to understand Japanese buildings in a new context. “There is a way of narrating the history of Japanese architecture as changes in style,” he says. “That’s not to be dismissed.” But Lippit believes he can also approach the country’s architectural past in terms of the archipelago’s ecology, most notably its history of deforestation. To do so, he studies both what he calls Japan’s “culture of building” and its “human-forest relationship.” The former, already evident in sixth-century architecture, refers to what materials builders used and how they procured and fashioned them. The latter, appearing more clearly in the early modern architecture of the sixteenth century, refers to what the builders’ choices said about how they saw their environment and themselves. “I don’t think it’s a matter of choosing one paradigm or the other,” he cautions. “But I think that the ecological framework really needs to be considered.” In his research and teaching, his new approach to natural materials and the built world has begun to blossom. A master carpenter’s tools are part of the exhibit. Fifteen years ago, Lippit wasn’t studying Japanese architecture at all. After growing up in Tokyo and in Riverside, California, near Los Angeles, he came to Harvard and concentrated in literature. He then won a two-year traveling fellowship, which he spent working at the Guimet in Paris, a museum famous for its Asian holdings. A newfound passion for Japanese art led him to Princeton, where he earned his Ph.D. in 2003, specializing in premodern painting. The path to temples was actually a short one. “Architecture and painting,” he explains, “are actually closely related in the Japanese context”: for instance, aristocrats not only displayed artwork in their homes, they also turned the mansions themselves into works of art with paintings on walls and sliding doors. After receiving his doctorate (and a position at Harvard in the same year), Lippit decided to teach architectural history. “Considering, as I do, that it’s one of the most remarkable architectural traditions imaginable,” he says, “premodern Japanese architecture has been dramatically under-studied.” Drawing on scholarly work by Conrad Totman, Ph.D. ’64 (an emeritus professor at Yale who has written a history of Japanese forestry), and William Coaldrake, Ph.D. ’83 (the head of Japanese studies at the University of Melbourne, and a carpenter), Lippit designed a course that explores, among other topics, the intertwined history of Japan’s architecture and ecology, a relationship that goes back more than a thousand years. Japan’s culture of building changed rapidly in the early sixth century, when Korean craftsmen brought the secrets of monumental timber-frame engineering across the Sea of Japan. Local carpenters already relied on elaborate wooden joints, rather than nails, to hold buildings together, but the Koreans taught them how to support enormous structures with heavy tile roofs (like the one on the merchant’s house) by funneling the buildings’ weight through brackets and sturdy foundational pillars. Suddenly, those Japanese master carpenters who practiced the Korean techniques could build on a previously unimaginable scale. Its structural and aesthetic qualities impressed the ruling elite, who lived in the Kinai basin (home of modern-day Kyoto and Osaka). These powerful clan leaders hired master carpenters to build palaces and sponsored the construction of Shinto shrines and Buddhist temples—one of which, Horyuji, still stands. By the year 628, dozens of Buddhist monasteries already dotted the basin. Cypress was plentiful, and the pace of building only increased. “There was a national campaign in the eighth century to build temples in every province in Japan under imperial control,” says Lippit. Although exact historical figures are elusive, the late Japanese historian Tokoro Mitsuo estimated that, between 600 and 850, monasteries alone used some three million cubic meters of wood. And this monumental construction, Lippit notes, represented only a fraction of the wood that nobles and commoners were using for their fuel and homes. As Kinai’s old-growth forests were disappearing, carpenters had to push farther and farther up into the surrounding mountains to find the cypress their patrons craved. In the case of the imperial monastery Todaiji, architectural aspiration confronted ecological reality. When it was first built in the 740s, Todaiji included two nine-story pagodas and a great hall 50 meters tall and 86 meters wide. The temple required 84 major cypress pillars and used up at least 2,200 acres of forest. It burned down during a battle in 1180, and a monk named Shunjobo Chogen set out on a quest to rebuild it, soliciting contributions from all over western Japan. His work crews had to travel, too, trekking hundreds of kilometers from the Kinai basin in search of untouched groves. During Japan’s medieval period (1050 to 1550), the scarcity of high-quality wood forced carpenters to adapt. Around 1300, deforestation spurred the invention of new tools. “Radical changes were precipitated by the medieval equivalent of the modern-day energy crisis,” writes William Coaldrake in The Way of the Carpenter. “The Japanese began to run out of straight-grained timber of structural dimensions.” Carpenters designed new tools to handle red pine and zelkova. They borrowed technology from those who forged samurai swords, adding a steel coating to formerly iron tools. The flexibility of the steel made the tools especially responsive, like “an extension of the wrist,” says Lippit. “You could wield them like a brush.” The steel could “cypress-ize” unruly wood to some extent, but more joints were necessary to connect smaller pieces of timber, a change evident in the appearance of medieval buildings. Although master carpenters still could and did build large timber-frame structures, political power in the medieval period was too dispersed among quarreling warlords to sustain a national building program. But in the early modern era, which began in the late 1500s, the upstart general Toyotomi Hideyoshi brought the warring factions to heel. The rulers of Kinai had never been able to extend their reach much beyond the basin, but Hideyoshi, by unifying Japan, had the resources of the entire archipelago within his grasp and could gather cypress and other rare trees from its remotest corners. By the time Hideyoshi came to power, the golden age of Japanese castle construction had already begun, and with it came rapid urbanization. Formerly, castles had been little more than fortresses perched on mountaintops. The new castle was more administrative palace than inaccessible fortress. Although these palaces required a staggering amount of timber (in some cases around 2,000 acres’ worth), the real ecological damage came elsewhere. “The reason why castles are associated with forestry predation,” explains Lippit, “is that they’re at the centers of large, sprawling cities made out of wood.” Tokugawa Ieyasu, Hideyoshi’s successor, oversaw roughly 260 domains, each with a warlord who wanted a castle of his own. “It’s probably safe to say that right around the mid seventeenth century was a real low point in this larger man-forest relationship,” says Lippit. While castle towns were putting unprecedented pressure on Japanese forests, a new architectural style emerged. Sukiya architecture, influenced by the sixteenth-century tea ceremony, imagined the human-forest relationship very differently. Previously, that relationship had been largely utilitarian (the right wood for the right job). But in sukiya, wood was chosen not only for its structural properties, but also for its ability to communicate certain values important to the tea ceremony: rusticity, imperfection, and humility. “During Japan’s medieval period,” says Lippit, “there emerged among the elite an ideal of rusticity and reclusion, one that was strongly influenced by Buddhist thought as well. Those who embraced this ideal usually imagined a rustic habitat to be the perfect antithesis to their monastic, aristocratic, or other urban obligations.” Where elite architecture had prized straight grains, smooth surfaces, and uniformity, sukiya brought to the fore tangled grains, hollows and knots (unthinkable in official buildings), and the use of as many different kinds of wood as possible. Despite its insistence on humility, sukiya was an elite form of architecture, best exemplified by the luxurious Katsura Villa outside Kyoto. Built for friends of the imperial family in the early seventeenth century, the villa is a series of modular rooms that open onto lush gardens. Inside, the variety of mismatched wood differs markedly from the creamy walls of cypress temples. (Some pieces are still covered in bark.) By employing these imperfections, the villa’s owners depicted the humble rusticity they wanted to ascribe to themselves.